Junior club from 10-16 year olds. We meet fortnightly at Westmill Village Hall, near Buntingford as well as outside venues. We have a varied programme of events from First Aid to rounder’s, bowling,sports evenings, photography, visits to farms, swimming, countryside walks, BBQ's, adventure days out, quizzes, golfing range, clay pigeon shooting, halloween evenings, and many varied visiting speakers. This year we are off camping for a few days, we will visit a dairy farm, ice cream factory, Barleylands Farm and also the Boxmoor Trust. 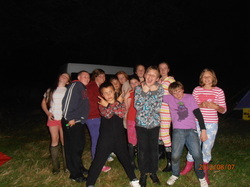 Previous camps we have visited racing stables and also stud, had a day at Celtic Harmony camp, had a day at Newbury races and a days cycling at an Activity centre in the New Forest. Members are from all walks of life, so come along and join in the fun, you don’t have to be connected to farming to become a Young Countrysider!!! R & B Juniors have had an eventful few months. In the County rally they were the winners of the junior handicraft classes. They had a very enjoyable evening at the Young Mariners when 20 members (joined by 3 from N. Herts) went underground caving. There were a few tight squeezes for some members but a very different and enjoyable evening.